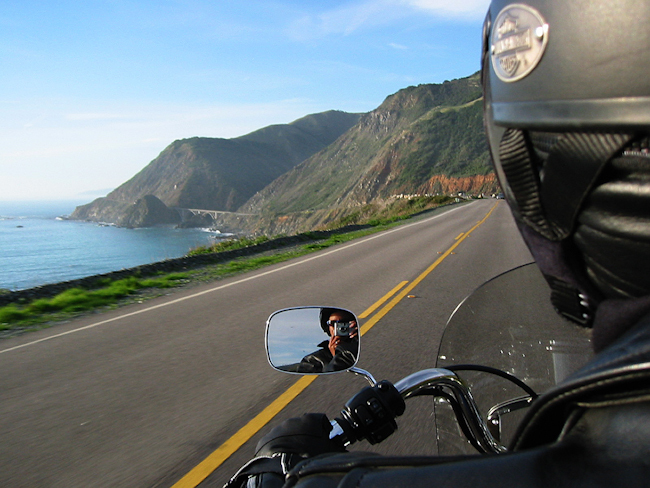 Feeling the rumble of our Harley while riding down the Pacific Coast Highway was the perfect way to relax and wind down. With no particular deadline or destination each day, we had two weeks to meander through the back roads between Portland and Las Angeles. The serenity and majestic ambiance of the giant Redwood Forest was our first haven. In order to dry out from the rain, we found a KOA ‘Kabin’ (a basic one room wooden shelter with a mattress on a wooden bed frame and space heater) nestled among the redwoods near Crescent City; we were pleasantly surprised by it’s seclusion. While parking our motorcycle and searching for a place to hide our helmets during a walk through the woods, we stumbled upon a huge redwood tree gutted out by a fire. Although this tree had a gaping hole 40 feet high by 15 feet wide in its center, it has survived for over a thousand years and grown to 250 feet tall. Continuing on through the national Park Forest reserves, we detoured 8 miles on a dirt road and were surprised by an elk eating peacefully by the roadside ahead. We carefully crossed a few shallow streams on our Harley before we reached the lush Fern Valley, a beautiful beachside park in the middle of the Redwood forest with the largest and most prolific ferns we’ve ever encountered. Ah, wine country… as we rode through the vineyards of Sonoma and Napa Valleys we could smell the aromas of the freshly crushed wine – another benefit of riding a motorcycle. We stayed in a spa (the ‘luxurious’ Comfort Inn hotel!) in Calistoga where we enjoyed fine dining (buying a bottle of wine and eating gourmet cheeses) while sitting in the mineral hot tub. 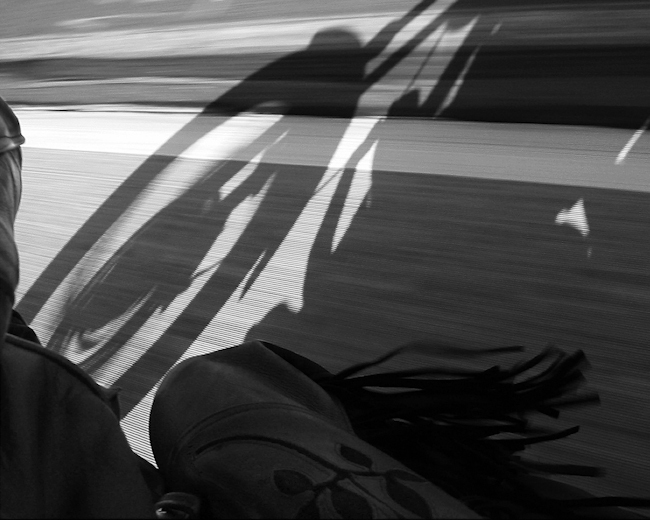 The best part of touring the wineries was the way people reacted to us when we walked in wearing our biker leathers. Everyone was wonderful! I think we stood apart from the typical tourists and thus received special attention. We even got invited into private tasting rooms and were welcomed on tours at Simi Winery and Mums sparking wine wineries. After San Francisco we experienced the most dramatic stretch of the Pacific Coast Highway – the 150 miles from Monterey to Malibu, known as the Big Sur coastline. Here the mountains drop directly into the sea and the road snakes around the cliffs edges creating an exhilarating motorcycle ride. The fog danced in and out of the valleys ,and the moist air was filled with the rich aromas of cinnamon and spices. One night we found a spectacular remote campsite perched right on the cliffside and enjoyed hearing only the sounds of the ocean crashing into the shore. Since there were no city lights in view we could clearly see the Milky Way arch like a rainbow from the mountains directly into the ocean. It was worth gingerly walking around the poison oak that surrounded our tent since this natural barrier kept the crowds and families away. 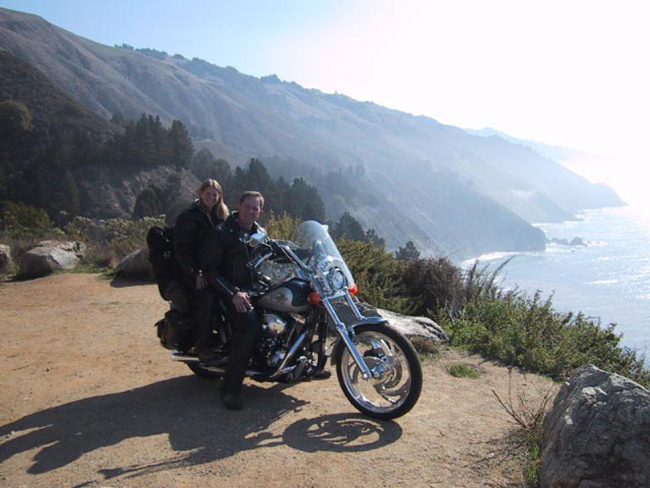 We arrived in Las Angeles after riding 1700 miles on the Harley – it’s surprising how many more miles rack up taking the back roads and the Pacific Coast Highway instead of interstate highways. During our last week in America we were busy making final preparations and visiting family and friends. Our home base was Dale’s parent’s house in Montclair, California and we visited: Desert Hot Springs to see Dale’s brother’s family, Hermosa Beach (stayed with Louis, a fellow Harley rider and past traveler I met on the Rick Steves tour when I did my photography work): Manhattan Beach (stayed with Zach and Jennifer, past managers from Blackbird resort in Belize): and Huntington Beach (stayed with Kitte and Erik Dudley, long time family friends). We can’t remember the last time home cooked meals have tasted so good, and how nice it is staying with family and friends – and we were only on the road for two weeks beforehand! We tried to reduce our pack sizes from 40 to 25 lbs or so, but without throwing out the tent, sleeping bags, cooking utensils, and medicine we just couldn’t do it! I’m sure after a few months we’ll have to throw out some clothes anyway). Our final farewell on U.S soil was on the evening of October 29th, 2000. After an expensive shared shuttle van for the hour trip from Ontario to LAX we boarded Air New Zealand for an overnight flight direct to Papeete, Tahiti. We were both excited and nervous as our plane took off; together we were embarking on a loosely planned 14-month trip, though we’d never traveled with each other for more than three weeks. Many people had asked us what we hoped to accomplish by our journey; in truth we weren’t sure. We didn’t have specific goals other than to experience a different way of life through travel and to hopefully become better people as a result. The only thing we knew for certain was that we looked forward to the unexpected and creating memories to last a lifetime. We tried to reduce our packs from 40 lbs to 25lbs, but without throwing out the tent, sleeping bags, cooking utensils, and medicine we just couldn’t do it!